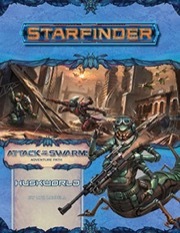 Hoping to find a way to fight back against the alien, insectoid Swarm, the heroes travel to a distant world already consumed by the deadly invaders. They soon discover they aren't alone in their struggles when they meet a handful of resistance fighters on the ravaged planet. 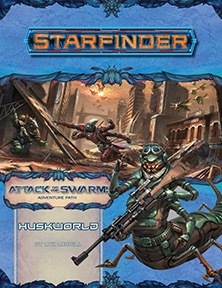 With the group's help, the heroes strike against a massive Swarm creature that is draining the world's resources dry and infiltrate an infested university to search for a dead professor's research that could lead to mythical holy site to the insect goddess Hylax and the secret to defeating the Swarm once and for all! I am excited by the writer - yay Liz! - and the story, but where is "AotS" #2 - AP #20? Part 1 in August, 3 in September, 4 in October. Something weird is going on here. Part 1 "Fate of the Fifth" is beginning to ship on august 12th & has a august 28th street date. Part 2 "untitled" is beginning to ship on september 9th & has a september 25th street date (but no product page yet). Part 3 "Huskworld" is beginning to ship on september 30th & has a october 16th street date. Part 4 "The Forever Reliquiary" is beginning to ship on october 28th & has a november 13th street date. I wonder whether there might be something spoilery about the product page for part 2 that they want to hold off on releasing it as long as possible? But that does seem unlikely since whatever they are trying to hide would at least be implicit in the pages for parts 3 and 4. Anyway, this is not the first time something like this has happened -- I vaguely recall it happening before with one of the recent Pathfinder adventure paths. That one was eventually straightened out. Pathfinder AP #139, the very first part of "Tyrant's Grasp" didn't receive a product page until after #140 & #141 received them. That was just a mistake and was remedied later. The same is probably the case here. That or the Cult of the Devourer did it. It's an ugly planet... a bug planet.